Today happens to be 14th of Feb, people around me are excited about Valentine’s Day, they are busy celebrating love and relationships. I think Valentine’s Day is a packaged affair, meant to boost the revenues of restaurants, jewelers, and gift shops, but then it’s just me and my random thoughts. Anyway, given its valentine’s day, I thought it would be a perfect idea to discuss relationships. Don’t worry, I’m not going to bore with a clichéd love story or give you any unsolicited advice on maintaining a great relationship, rather I’ll talk to you about two sets of numbers and how you can measure the relationship between them if at all there exists one. A quick recap here – Chapter 1 to 7 of this module, we discussed a rather simple technique of pair trading. This was as taught by Mark Whistler. Moving forward from this chapter, we will discuss a slightly more advanced technique of pair trade. This is also called ‘Statistical Arbitrage’ or ‘Relative value trading’ or RVT in short. Do you remember the time your math teacher discussed the equation of a straight line in the class? If you were like me, you’d have promptly ignored the lecture and looked outside of the window, quietly rebelling against the mainstream education. But then, if only the teacher had said ‘learn this, you’ll make money off it someday’, the interest level would have been totally different! Click here for a detailed explanation, or continue reading for a barebone explanation. The equations states, the value of a dependent variable ‘y’ can be derived from an independent variable ‘x’, by multiplying x by its slope with y’ and adding the intercept ‘e’ to this product. Let me elaborate on this and by the way before you start thinking why we are discussing the straight line equation instead of relative value trading (RVT), then please be rest assured, this concept has deep relevance to RVT! Now, if you were to guess the number of push-ups FF2 would do on Saturday, what would it be? I guess it’s a no-brainer, it would be 30. This also means – the number of pushups FF2 does, is kind of dependent on the number of pushups FF1 does. FF1 does not really bother about FF2, he will go ahead and do as many pushups his body permits, but FF2, on the other hand, does twice the number of pushup as FF1. So this makes FF2 a dependent variable and FF1 an independent variable. Or in the straight line equation, FF2 = y and FF1 = x. The number of pushups FF2 does is equal to the number of pushups FF1 does, multiplied by a certain number, plus a constant. The straight line equations states, the value of a dependent variable ‘y’ can be derived from an independent variable ‘x’, by multiplying x by its slope with y’ and adding the intercept ‘e’ to this product. There are two hungry men, let’s call them H1 and H2. Just like FF1 and FF2, H2 eats twice the number of paratha as H1 plus 1.5 more. For example, if H1 eats 2 parathas, then H2 will eat 4 plus eat another 1.5. H2 will always ensure he eats that extra 1.5 parathas, no matter how full he is. 4*2 + 1.5 = 9.5 paratha! Remember, the number of parathas H2 eats is dependent on how many parathas H1 eats. H1, on the other hand, eats till he is satisfied. Given this, let us a construct a straight line equation for these two hungry men, just like the way we did for the two fitness freaks. Here, H2 is the dependent variable, whose value is dependent on H1. 2 is the slope, and 1.5 is the constant. Before we proceed, let’s make a small change in the paratha example, think of ‘Y’ as a diet conscious person. Every day, irrespective of how hungry or full Y is, he eats just 1.5 parathas. Not a morsel more or not morsel less. So, X eats 3 paratha, Y eats 1.5, X eats 5, Y eats 1.5, X eats 2.5, Y eats 1.5. So on and so forth. So what do you think the equation states? The slope here is 0, hence, y is not really dependent on x, in fact, the value of y is a constant of 1.5, which is quite obvious. Hopefully, you get the point by now on how you can relate two sets of numbers. X is the independent variable and Y is the dependent variable. Given this, do you see a relationship between these two sets of numbers here? Eyeballing the numbers suggest that there is no relationship between X and Y, definitely not like the one which existed in the above two examples. But this does not mean that there is no relationship between the two at all. It’s just the relationship is not obvious to the naked eye. So how do we establish the relationship between the two? To be more precise, how do we figure out the values of the slope’ and the constant ‘ɛ’? Well, say hello to linear regression! I’ll introduce the same to you in the next chapter. When the relationship is not obvious, one can identify the relationship by employing a statistical technique called ‘Linear regression’. Sir excellent write up as usual. Don’t get me wrong but I think after waiting eagerly for a week I think the chapters are way too small. Sundeep, I’m glad you liked the chapter. I had to stop this chapter here as the explanation of linear regression would make it very lengthy, so decided to keep that as a new chapter. Loved the short and sweet chapter. On the first look I wanted to run away because of Math. But I stayed.. It was very easy to understand. Thank you so so much Karthik Rangappa Ji. Thanks, Michael. The next one (hopefully) will get more interesting! Very nice sir, waiting for next article. Yes, hopefully in the next week! Hi Karthick- provide a Kindle version of all your brilliant write ups. That would be immensely beneficial. Will keep a note of that, Vishnu. Sir are all mean reverting strategies a variant of pairs trading? What are few stat arbitrage strategies other than mean reverting ones? Risk arb, Merger Arbitrage, and all strategies where the corporate action is involved. Sir I’d guess arbitrage based on M&A or corporate actions wouldn’t happen very often and so it’s not feasible for long term as the signals would be less frequent. Can you name one or two statarb strategies that could produce trading signals at least 5 to 6 times per year,that is not pairs trading? Option based, delta hedging in another strategy. I will discuss this in the same module shortly. 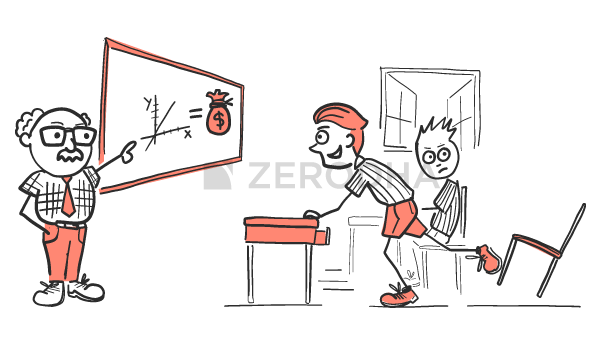 I personally learnt a lot from Zerodha Varsity. The best thing what I like is the approach taken to explain things to the layman and taking real world examples for trading activities. (Special mentions Short selling and Futures market explanation). Also, I would like to know the various statistical and data science techniques which can be used for trading. Glad you liked the contents here, Rajarshi! This entire module is dedicated to stats based trading strategies. I will talk about linear regression in the next chapter, which should be out next week. Happy learning! Karthik, I read most of your writings and like them very much. Here, you are mixing up terminology. You are calling ‘slope’ as ‘intercept’ and ‘intercept’ as error. Please correct. Sure, let me read this again. Slope = beta = M.
Thank you so much! I’ve made the corrections. Sir I’ve a question. If one has learnt thoroughly whatever is written in varsity till now, mastered everything, what level of expertise do you think one would have, in respect to trading alone? Around 30-40%? Thanks in advance. Sundeep, it really depends on how well you translate the learning to practice in the market. Sir I can understand what you’re saying. But I just wanted to know, if this was a university syllabus, what is the level of completion, including the latest chapter. I’m just trying to gauge the depth of things to come. Thanks for the amazing work you’re doing sir. I’m behalf of all varsity readers, I’d like to say that we’re greatly indebted to you. I like the way you explain things. I guarantee no teacher can explain in such a simple language. what is the risk reward ratio for this kind of trading? It is around 1:5 reward to risk of 1.